An Account Of The Middle: A Girls Day Out: Which Way Is North? A Girls Day Out: Which Way Is North? Last week, in the interest of enjoying what remains of the pretty weather for this season, I decided The Girls and I would spend the weekend doing something other than sitting at home. L already had commitments to the SD and would not be home until late in the evening. Now the question was... what to do? what to do?? 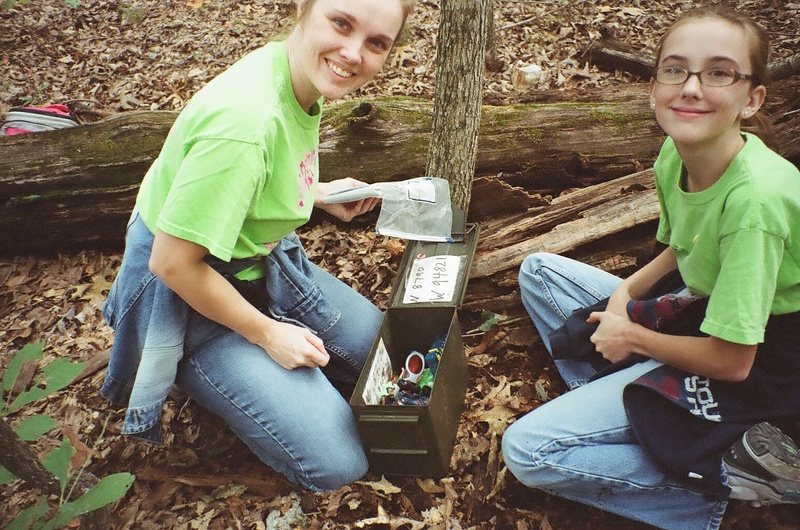 Geocaching, the high tech modern day game of treasure hunting. And here's the best part! I didn't need to buy a GPS device, there's an app for that!! That's right!! I just logged on to the applications store selected the official "Geocaching Application", paid the $9.99 fee, and began the download to my iPhone. 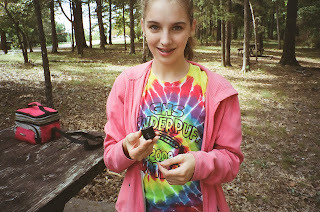 I discovered from the list that there are 53 "Arkansas State Park" caches hidden in various parks throughout the state. I selected the park closest to us and saved the information to my new application. Tomorrow The Girls and I would be joining the game! 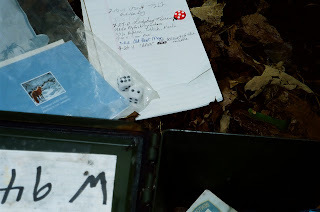 Log your experience at http://www.geocaching.com/. We decided the item we'd leave behind would be dice. 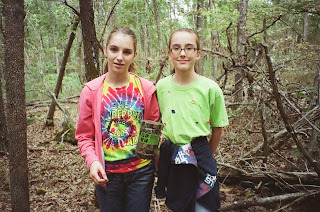 So we threw those in our bag along with some granola bars, an ink pen, the camera, and an extra roll of film. Yes, that's right. I'm talking about that brown sticky stuff that comes in a metal roll that absolutely under NO circumstances can be exposed to light. Can I just say that I love my digital camera, but remembering to charge the battery more often than not is an epic fail for me. But thankfully I had a plan B! I love my plan B's almost as much as I love my lists. The things we didn't remember to throw in the bag? 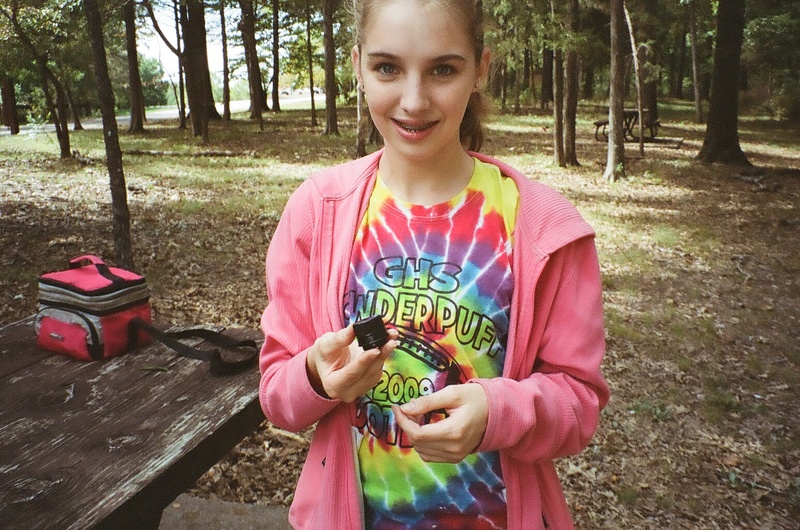 Lip gloss, tick repellent (more on that in a moment), and directions on how to use a GPS locator and compass. I called L before we left to let him know our plans and general location, just in case. I considered it a good thing that MC S&R was already assembled for a training exercise. I figured that should we go missing their response time would rock. When we arrived at the park we entered the Forest Trail from the backside and were approximately .5 miles from the cache according to the app. The way the app works is you are the blue dot and the cache is the green balloon. The closer you get to the cache the closer the blue dot gets to the green balloon. Simple! Right?! We followed the trail until the blue dot appeared to be even with the green balloon and then we began our journey through the woods to find our cache. The Girls told me they had done something similar to this in summer camp so I felt that collectively we had a little experience. After about 15 minutes of wondering around trying to make the blue dot and the green balloon connect GG asked me if I had a compass. Why yes I do!! After all there's an app for that!! So I flipped the screen over to the compass and handed her my iPhone. She looked at it, looked at me, and said, "How do you read a compass?" Now at this point it occured to me that I don't actually know how to read a compass. I've never rarely had an occasion to need to read a compass. My truck has a compass in it, and if you need to know which way is north I can turn my truck around until it says north. (yea, I've actually done that) But the truth is I don't speak the n/s/e/w language at all really. I don't even speak the hwy/ road/ street name language real well. I am, however, fluent in store names. If you tell me what building, store, or business you're next to or across from I can find you in a flash. Me: I don't know, didn't they teach you that in camp? Me: Then why did you ask if I had a compass? GG: I just thought a compass might be helpfull right now. Me: Not if we don't know how to read it. GG: So I guess we'll just go back to wondering around. About 10 minutes later we wondered within 4 feet of the green balloon according to the app and NG spotted the cache. 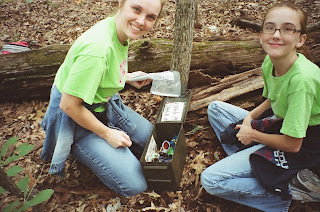 After signing the log, choosing a trinket (The Girls wanted a fishing lure), and depositing our own trinket in return, we replaced the cache in it's hiding spot and headed out of the woods. We were pleased that we were able to locate the cache without to much trouble, we were even more pleased that we were able to locate the truck. We went on to locate two more caches at the park before calling it a day. The second cache we found held a geocoin, which we took and later deposited in a cache at Hobbs State Park (more on that here). On our way home we stopped to grab a late lunch. About halfway through the meal we realized we had collected more than trinkets from our trek through the woods. We also had quite the collection of seed ticks! Who am I kidding I was covered in seed ticks I didn't check to see if anyone was looking, we just stripped!